I develop approaches to understand the effects of global change on species and their interactions. 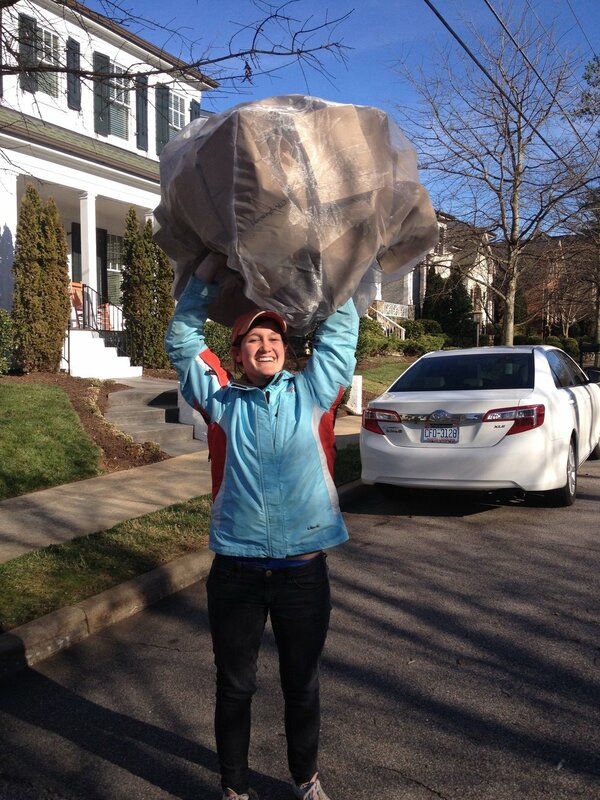 I study species’ responses to global change, including plant and insect physiology, phenology, and microbiomes. Though my interests are diverse, they are anchored in understanding how damage to plants has changed due to human influence. My focus has been damage by insect feeding, or ‘herbivory’, though I also have ongoing projects on bacteria and fungi. Herbivory has major effects on the fitness and even diversification of plants. It also influences ecosystem properties, such as nutrient cycling, and affects ecosystem services to humans, including food and timber production. As a result, changes in herbivore communities can have diverse and cascading consequences. My research has addressed hypotheses about the effects of climate and land use change on insect herbivores and their host plants. I have shown that 1) insect abundance, diversity, and damage have changed over time due to local and global warming and land use change, and 2) relationships between plants, herbivores, and herbivore natural enemies have shifted due to phenological mismatches associated with global change, 3) urban warming imposes water stress on plants, reducing photosynthesis and carbon storage, and insect herbivores exacerbate negative effects of urban warming on plant growth. Below, you’ll find descriptions of projects I worked on/ work on now with the help of student researchers and collaborators. First, you’ll see projects I began as a postdoctoral fellow at the Harvard University Herbaria, where I developed methods to quantify herbivory on herbarium specimens, allowing us to ask how insect damage has changed over the past 100+ years of global change. Second, I detail work I began earlier in my career that uses urban heat islands to 1) understand the effects of urbanization on species and 2) predict the future effects of global climate change. Finally, I describe a project that spun out of a friendship between collaborators in North Carolina and Panama. We swabbed temperate and tropical ant nests to determine how ants structure the microbes in their homes and whether we can learn from their methods. Thanks for being here! I’m always excited to chat about collaborations related to global change and plants, insects, and/or microbes. Please get in touch via the Contact page. This figure exemplifies the timespan covered by herbarium specimens, along with the date, location, and herbivory data therein. To read the text, click on the image for a larger version. Since at least the 1700s, scientists, including Linnaeus and Darwin, have collected herbarium specimens to describe new species, aid taxonomic classifications, and as part of regional floristic treatments. These specimens contain data recorded unintentionally by their collectors, including damage by insects and pathogens. I have been able to record data on diverse types of herbivory and lesions created by plant pathogens in a way that is replicable. Novel data derived from these methods encompass the largest temporal span of plant-herbivore interaction data during anthropogenic change. Using these data, I showed that herbivory increased over the past century in the northeastern US. 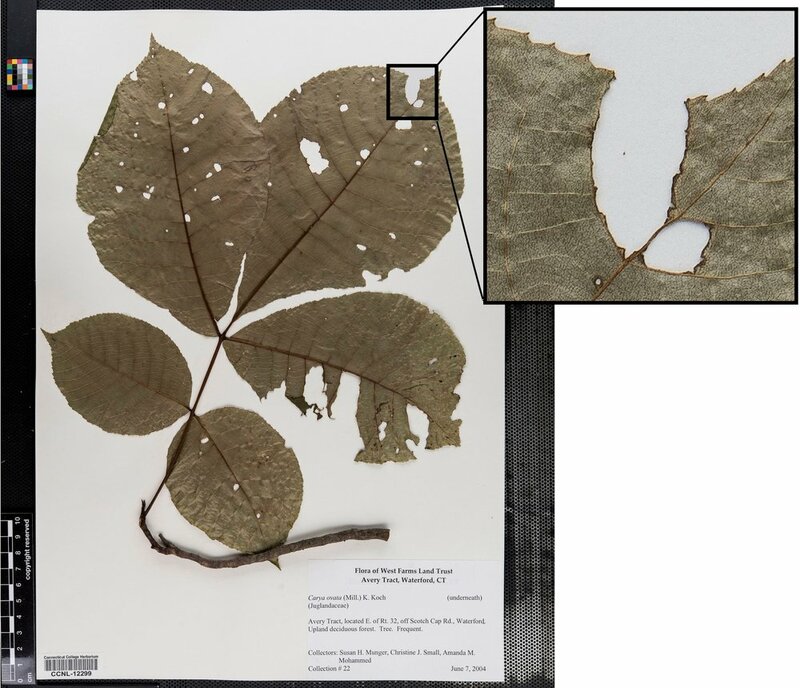 Herbarium specimens collected within the past 10 years were 23% more likely to contain damage by leaf-feeding insect herbivores than plants collected in the early 1900s. Trends across years, latitude, and temperature provided evidence that increasing herbivory is due in part to winter warming that has positive effects on insect herbivores by expanding their ranges and/or increasing their in-situ abundances. I built a system to quantify insect damage on herbarium specimens, greatly increasing the time and spatial scales at which herbivory can be studied. This is a zoomed in section of an herbarium specimen showing insect chewing damage. The genus Protea (Proteaceae) is the focus of a collaborative project I am part of separating effects of temperature change over space and time on flowering. 1) Understanding the effects of phenology on herbivory: Through a cross-continental sample in the northeastern US and Europe, I found that plants whose phenology is particularly sensitive to warming are exposed to more herbivory now than in the early 1900s, whereas less sensitive plants are not. This finding indicates that plant traits (here, how sensitive leaf-out is to temperature) mediate shifting interactions with herbivores. Phenological sensitivity to temperature is generally considered beneficial to plants as the Earth warms, but this research revealed that it may have a long-term cost in the form of intensified antagonistic interactions in plants that leaf out early in response to climate change. 2) How urbanization over time affects insect chewing damage: Herbarium specimens have been disproportionately collected near roads and herbaria. As a result, they capture the effects of urbanization over time. In a project leveraging this coverage, I found that chewing herbivory is reduced in urban areas. By pairing specimen data with present-day observations of insect herbivores, I then showed that northeastern cities, and perhaps north temperate cities more generally, serve as filters for many herbivore species. 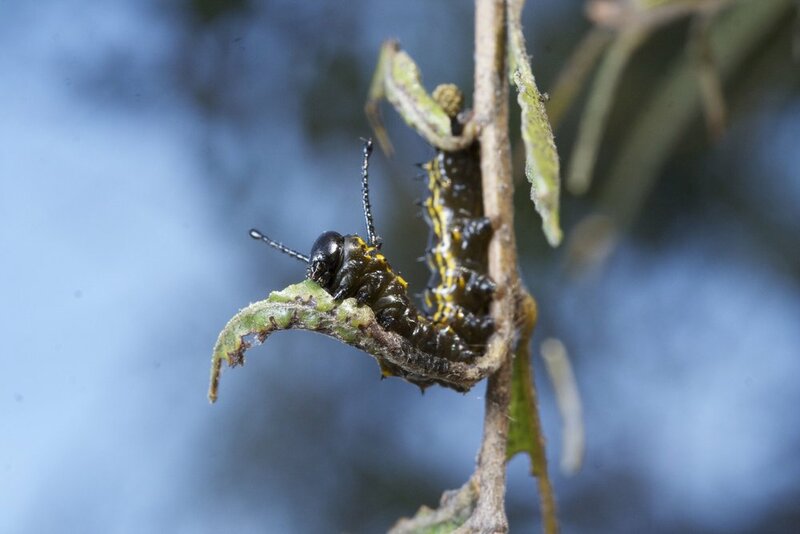 Thus, while the urban heat island effect may increase abundance of certain herbivores within some cities (see below), many mandibulate herbivores, such as butterflies and moths, are excluded from urban centers. This project is expanding into plant and insect collections from Paris and Tokyo. 3) Spatiotemporal effects of temperature on plant phenology and herbivory: Because long-term data are rare, people have assessed effects of warming on various aspects of biology by studying how they shift across latitude and elevation. However, it is unclear whether temperature change over space should predict the effects of climatic warming over time. In this series of projects, I teamed up with collaborators to leverage the unique spatial and temporal coverage in herbarium specimens to determine how phenology of an iconic genus from South Africa (Protea) and phenology and herbivory of blueberry species (Vaccinium angustifolium, Vaccinium corymbosum) from the northeastern US respond to warming across time and space. These studies uniquely test in what situations we can rely on space-for-time substitutions for forecasting the effects of climate change. NOTE: Specimen images above and those I have posted to social media are from the Northeastern Botanical Collection's digitization project of New England plant specimens. For details about this collection, email Mikaela Schmull at mschmull@oeb.harvard.edu or see the Harvard Herbaria digitized collections. I think museum specimens will be key to the next major advances in our understanding of global change, greatly expanding the spatial, taxonomic, and temporal scopes at which global change hypotheses can be addressed. I co-edited a special issue along these lines in Philosophical Transactions of the Royal Society B. 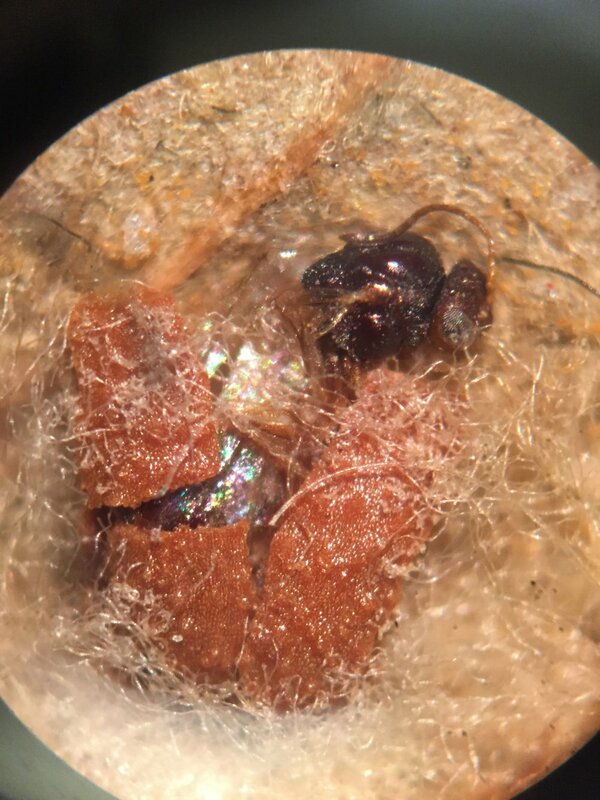 This special issue, “Biological collections for understanding biodiversity in the Anthropocene” (link) brings together experts studying diverse taxa to define next generation applications of museum specimens. The Raleigh, NC, USA skyline: The largely suburban development pattern of Raleigh creates a thermal mosaic (see below), providing a built-in study system in which trees that are close together (<200 m) experience different thermal conditions. For over a century, people have wondered why plants in cities have more insect herbivores than plants of the same species living outside cities. I studied the extent to which urban warming—heat released by sidewalks, asphalt, and other hard surfaces in cities—drives this pattern by sampling insects on street trees across a gradient of urban temperatures. I found that urban warming increased abundance of a common pest known as a scale insect (Parthenolecanium quercifex) by 13 times. I also found evidence that these effects were a result of P. quercifex evolving to tolerate urban heat and disruption of its interactions with parasitoid wasps*. 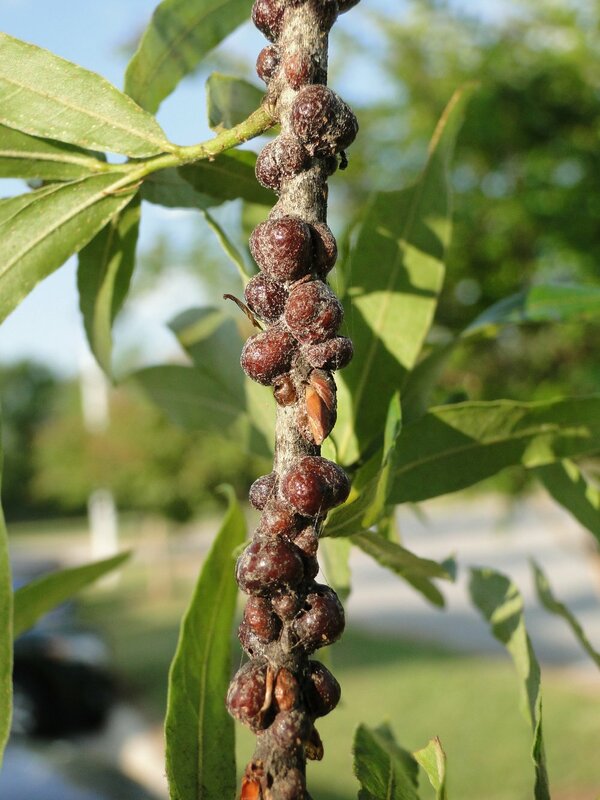 Overall, this study revealed that insect pests and warming combined to reduce street tree growth. This work continues in Steve Frank’s lab at North Carolina State University, where it has become a major focus of research. A full summary of this work is here. This shows the mosaic pattern of urban warming across the Raleigh, NC, USA urban heat island. The map was created from satellite measurements of surface temperature. The dots represent study sites, and their size represents insect pest abundance on street trees. Reproduced from: Meineke EK, Dunn RR, Sexton JO, and Frank SD. 2013. Urban warming drives insect pest abundance on street trees. PLoS ONE, 2013; 8 (3), doi:10.1371.journal.pone.0059687. *Parasitoid wasps often eat insect pests. Most are smaller than a millimeter. They live in almost all habitats worldwide, including cities. Within cities, areas that are warmer tend to be so because of high densities of sidewalks, pavement, buildings, and a lack of vegetation. As a result, it is impossible to separate the effects of land cover and microclimates on biotic processes. However, Los Angeles, CA, USA is unique in that land cover and microclimate are decoupled because of coastal weather patterns. With the help of volunteers, my collaborators on this project sampled phorid flies, one of the largest, most biologically diverse families of true flies (Insecta: Diptera: Phoridae), at 30 sites distributed across the central Los Angeles (LA) Basin. They found 30 undescribed species of phorid flies in urban LA, underscoring how diverse and underexplored urban insect communities are. See examples of their news coverage here and here. 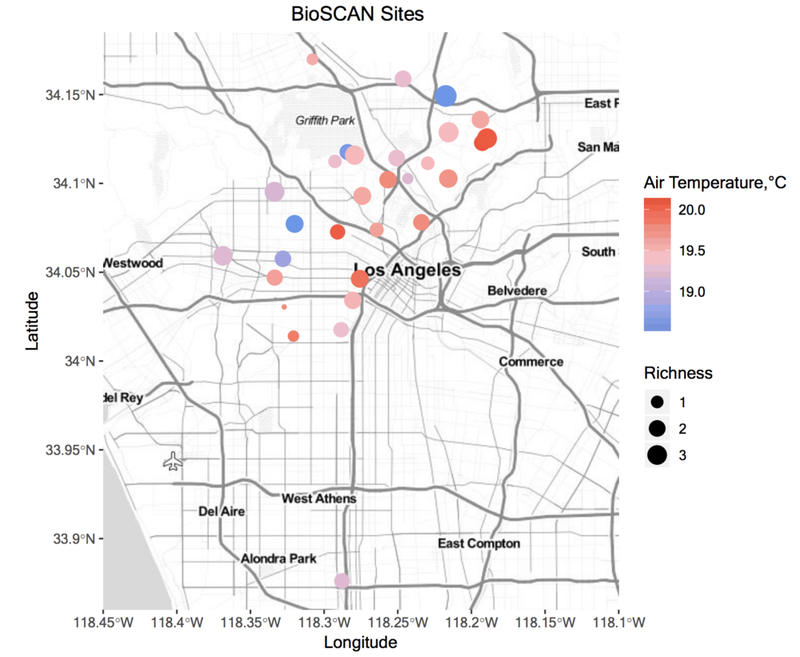 Sites across Los Angeles where volunteers placed malaise traps in their backyards to capture insect communities: The color of the dots and their size shows the non-linear relationship between phorid fly abundance and temperature. We leveraged these data, and the fact that land cover and microclimate are uniquely decoupled in LA, to determine how these two factors affect insect communities. Abundance, richness, and community composition of phorids were most parsimoniously accounted for by mean air temperature in the week preceding sampling. Sites with intermediate mean temperatures had more phorid fly individuals and higher richness. Communities became more even with lower minimum temperatures and further away from natural areas, suggesting that communities further away from natural source populations may be more homogenized. Species composition was best explained by minimum temperature. Inasmuch as warmer areas within cities can predict future effects of climate change, phorid fly communities are likely to shift non-linearly under future climates in more natural areas. This study is the first to separate urban heat and land cover and provides evidence that heat is a key factor driving urban community assembly. We have a paper under review at Proceedings of the Royal Society B and another under review in Ecological Applications. Stay tuned! Ecologists have recorded a lot of climate data over the past decades, mostly in an effort to understand how living things respond to climate change. Some of these observations are collected using expensive instruments that are located at permanent or semi-permanent sites. However, these weather stations are often too spread out to provide data useful for, for example, understanding temperatures experienced by frogs in a particular stream. Instead, ecologists have increasingly turned to inexpensive data loggers to measure climate at these smaller scales. We do so with a general sense of how accurate these tools are; data loggers are tested for accuracy and precision in laboratories by the companies that make them. But ecologists deploy these tools across deserts, tropical forests, tundra, and cities, all far cries from the laboratories in which data loggers are tested. As a result, we do not know how accurate our climate data actually are. I teamed up with other ecologists and a climatologist to address this issue. We set up a controlled experiment to test the accuracy of data loggers across forested, open field, and urban habitats. Based on our results, we provide a set of recommendations and best practices for collecting climate data in field ecology. We predicted that ants maintain distinct microbiomes within their nests, and are under selective pressure to limit ant and plant pathogens. In support of these predictions, we found that internal and external nest sampling locations had distinct microbial communities, and ants maintained lower bacterial richness in their “nurseries.” Additionally, ant pathogens were suppressed in chambers that ants actively inhabited. However, plant pathogens were not, which challenges our assumption that these mutualistic ants defend host trees from microbial antagonists. These results show that ants influence microbial communities inside their nests similar to studies on human homes. Unlike humans, ants limit the bacteria in their nurseries and prevent the buildup of insect-infecting pathogens. These results highlight the importance of documenting how indoor microbiomes differ among species, which can improve our understanding of indoor health in human dwellings. In the future, we plan to grow Cecropia in greenhouses to further address some of the hypotheses described here. 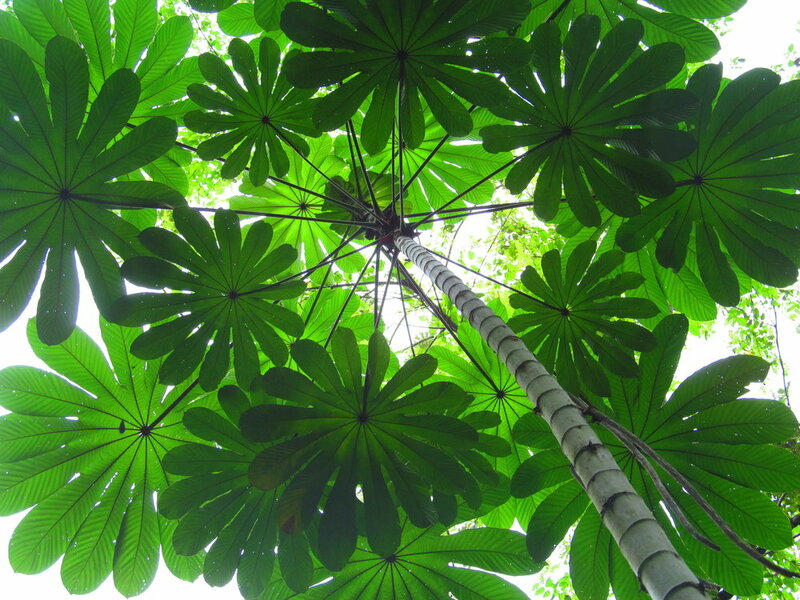 Because Cecropia is a light-loving plant genus that often occurs in urban areas, it will also provide the opportunity to investigate how urbanization affects tightly co-evolved mutualisms. This group has another ongoing project in which we placed wooden nest boxes in Duke Forest, NC, USA to determine how temperate ants and termites structure nest microbial communities. We have a paper in revision at Proceedings of the Royal Society B. Stay tuned! Below is a poster that describes our results.